Chiropractic is the hands-on system of healthcare promoting optimal whole-being wellness, spinal health, and physical fitness. Chiropractic is the art and science of aligning your body for optimal neurological, bio-mechanical, and physiological function. 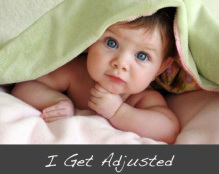 Bring your whole family to get adjusted! Chiropractic doctors practice natural, drugless, non-invasive health care and rely on the body's ability to self-heal. Sounds ideal, but how does that work? We look at the whole picture. Like other healthcare providers, chiropractors follow a standard routine to gain information about you. We consult with you, review your case history, conduct a physical examination, and may even request laboratory analyses and/or x-rays. Unlike other healthcare providers, however, chiropractic physicians also conduct a careful analysis of your physical structure and pay particular attention to your spine. We also ask you about your life. ~ What is your level of stress and how do you deal with stress?